Sometimes things just converge together and make planning a week’s worth of school nearly impossible. For me, that’s usually the same week I need the kids occupied so I can concentrate on other work deadlines. Last week was one of those weeks. While searching for something else I came across the Pack-N-Go Girls Mystery series and the related “extending the learning” packs on TeachersPayTeachers.com. With limited time and no plan in place I bought the Kindle version of the first Mexican book – Mystery of the Thief in the Night (Pack-n-Go Girls – Mexico Book 1) – and downloaded the free packs from TPT. I also added in some ancient civilizations videos & worksheets from BrainPop.com (Maya, Aztec, Inca, Columbian Exchange, Conquistadors) and our regular math and spelling schedule. I don’t think this week’s lesson will win and awards but it was exactly what we needed to get through the week and not fall behind. 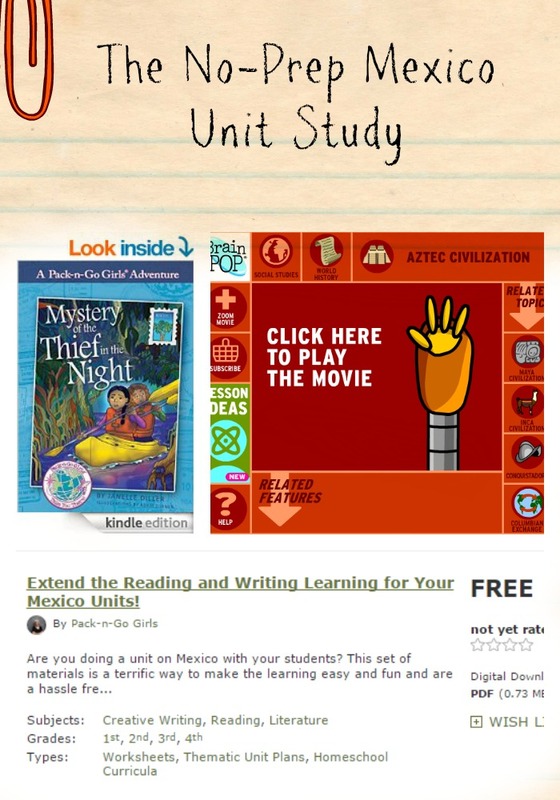 With additional books set in Mexico, Austria and Thailand and more free related learning packs on TPT if I ever need another no-prep week I’m glad to know they are there.